Some times ago I gave you advices on how to wear the scarf and only advocated for big fluffy scarves. Yet smaller ones can be cool too. They’re not exactly here to keep you warm, but they’ll keep you stylish at least. Assuming you’ll wear them properly. Be careful, this can make you look like a stewardess or a conservative old lady. Here are my tips to master this knot. I recommend a modern print because other may create that dreaded stewardess look. 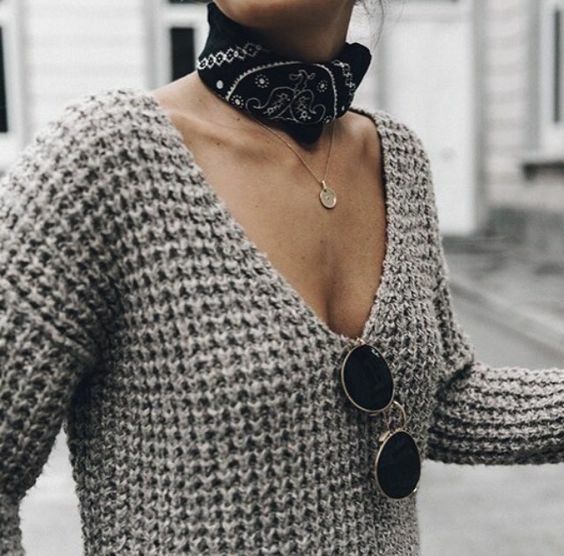 The bandana print is always a great choice. 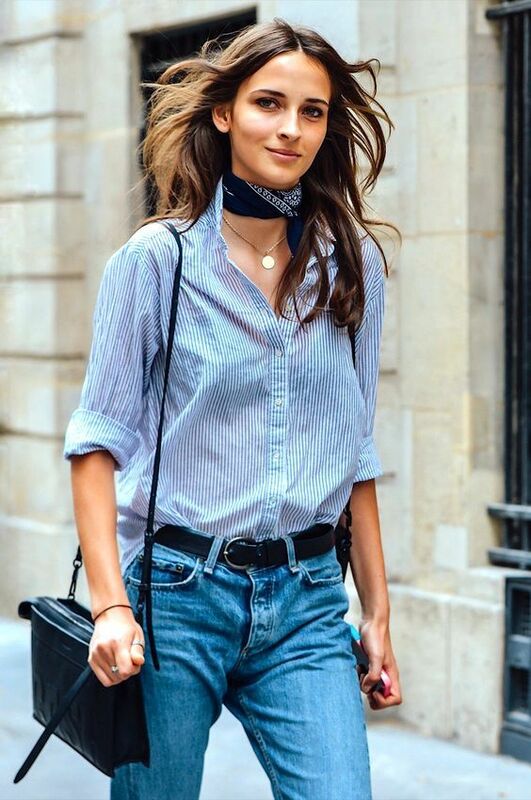 If your print is kind of old-fashioned, balance it with cool clothes, like a striped boyfriend shirt, a T-shirt or any minimalist styling (avoid anything that may look like it could belong to your grandma, only the Hermès square shall). 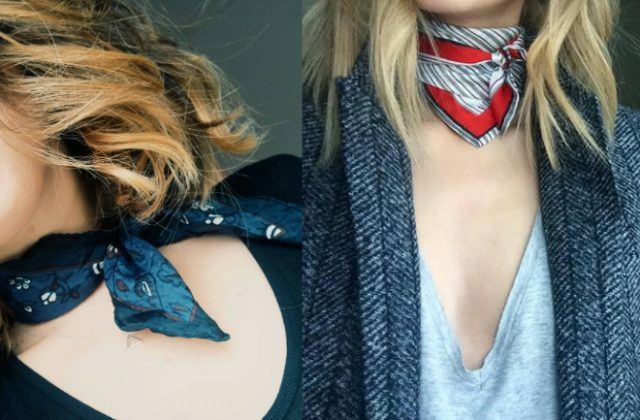 Let’s be honest, mini and small squares are THE best to achieve the neckerchief look. Yet you may succeed with larger versions that climb higher on the neck. Those are recommended for long necked ladies with defined jaws only. 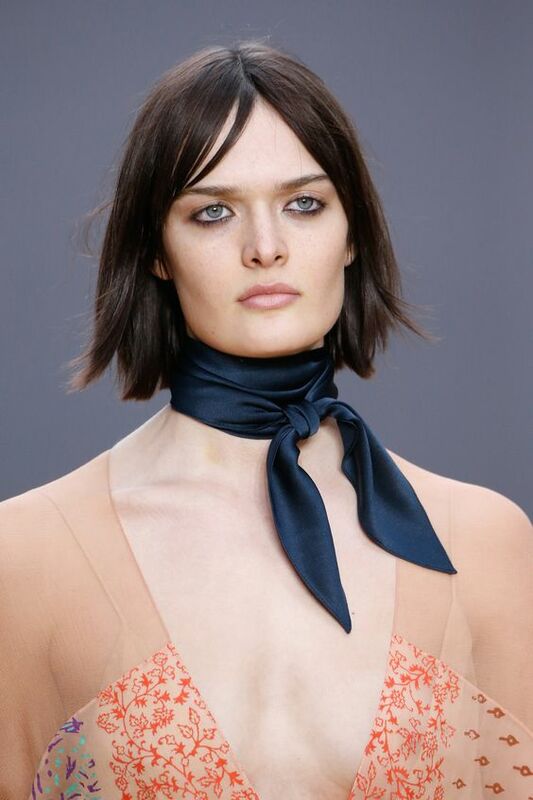 My favorite option is to wear the neckerchief as a chocker with a side knot. Make it a band, hide the edges in the middle and wrap it flat around your neck as many times as needed. Knot the bits on the side. They can be long and hang loose, be tiny and hold stiff and you can even hide them inside or in the back. You do not want it to be messy (remember this, I usually advocate for the opposite). Wearing the knot on front is also an option, but I recommend to pair it with a fun attitude as it instantly looks more conservative. The triangle fold with the arrow on the front that I recommend with long and loose scarves is mainly to be avoided worn look on smaller squares as the result may evoke a cowgirl or a bib. But you can make it tight as seen on the right cover pic above. V necklines, round necklines… fabrics, prints… no rules! I only suggest to stay away from things that may look like they belong to a disguise. Therefore, I’d avoid the jean jacket (Texas girl or bad gal from the fifties) or the white shirt (air hostess). As usual, clever print and color mix are a road to success. Do you think you’ll try the neckerchief? This is really cool – merci beaucoup! Would you suggest a few detailed tips on choosing the patterns and places to hunt in Paris? Loved the article. 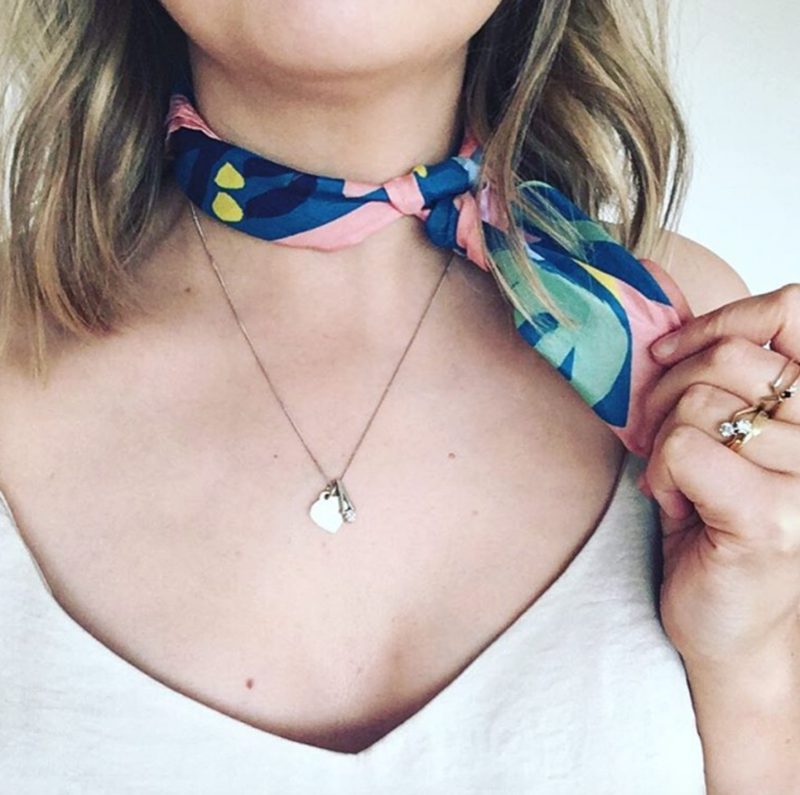 I love neckerchiefs, specially with modern prints. I loved how they look with striped blouses, wonderful. 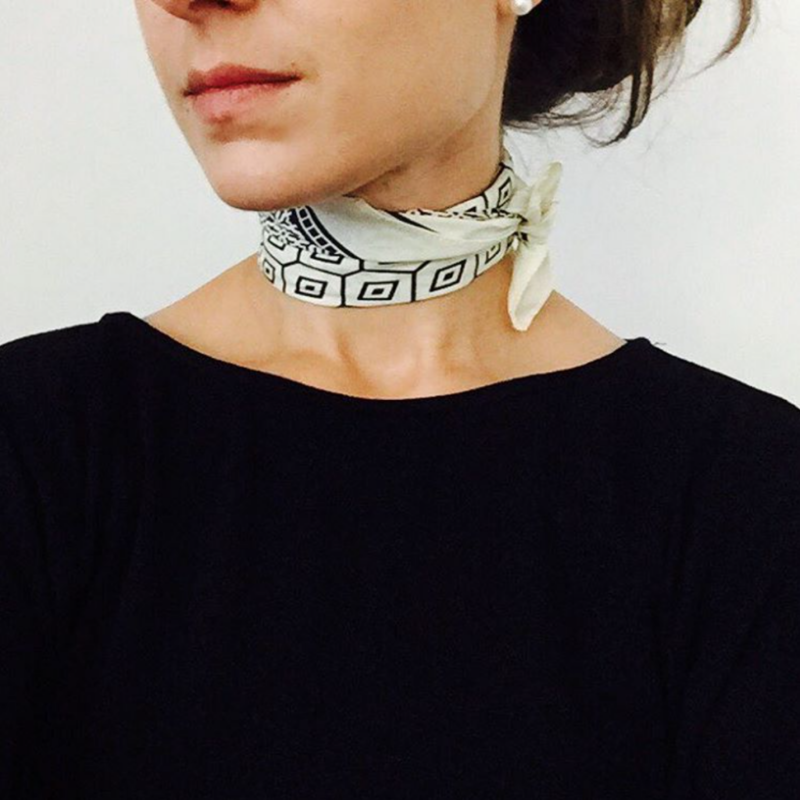 I was wondering – how do you like neckerchiefs used in the hair, like around a chignon? Good advice on wearing neckerchiefs is exactly what I was looking for lately! Perfect theme for autumn. Thanks a lot. It looks like this works only with low necklines and high ones. Am I right? Fun to see different ways to use some of the beautiful smaller scarves in my drawer! 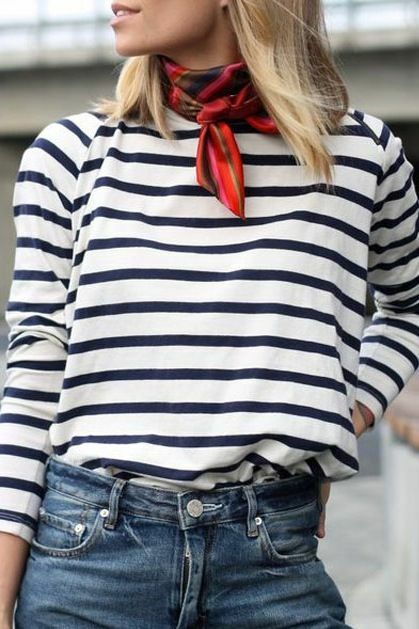 I love neckerchiefs and have worn them like this for years. I’m in my early 30’s, but my grandma often wore scarves like this and I liked the way it looked on her so I started too, she shared some of her collection with me. I wear a small knotted scarf under a low turtle neck sweater, just peeping out.